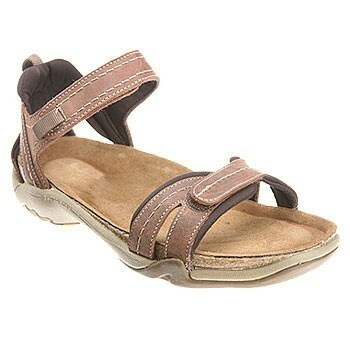 Rely on the Flow sandal from Naot for all your outdoor adventures. With Velcro® straps, a durable rubber sole, and a soft textile lining, this rugged sandal is ready for fun at the beach or the park. A removable cork and latex footbed ensures the right fit. The Naot collection is an extraordinarily broad selection of styles for both men and women. Everything from boots to sandals, classic business shoes to the latest trend-setting styles - all showcase Naot's strong design sense and attention to the details that matter, and all feature Naot's commitment to absolute comfort. This is a collection of superb quality, known for its use of beautiful leathers, distinctive European-influenced designs, hand-sewn construction, thoughtful comfort features, and the advanced Naot contour footbed system - a remarkable blend of natural materials such as cork and latex, which molds itself to your own unique footprint for blissful cushioning and superior support.